It was incredible to see over 100 people coming together last night for the Brightoneer’s first event. Dave and I thought it would just be a small gathering, but with 150 people registered it had grown to something much bigger than expected. I was getting nervous when just a couple of hours before the start, some people were saying that they wanted something with more structure, and at the same time I was getting messages from other people saying that they wanted to keep it very free-form. I guess you can’t please all the people all the time! Then someone wise said to me that the people who come will be right people, and that’s exactly what happened. I’m glad to say that included some of the ‘structure-seekers’ who I had some great chats with and who brought a positive energy to help with more focussed events in the future. Feel free to add others in the comments. It was also great to have our MP Caroline Lucas there, engaging with people, listening and supporting as well as Thurstan Crockett from Economic Development at the council. There are people in government that care as much as we do, which gives me a lot of hope. So we’re off to a great start. We need to make Brightoneering projects like these the main thing in our economy, not just a small ethical sector. We need to grow this economy to provide everything that local people need from energy to food to transport as well as exporting the things that Brighton is best at – like the creative and digital sectors – to the rest of the world. We need to build this pioneering new economy by collaborating and working together. We now have a community of almost 200 people and growing who want to be a part of this. 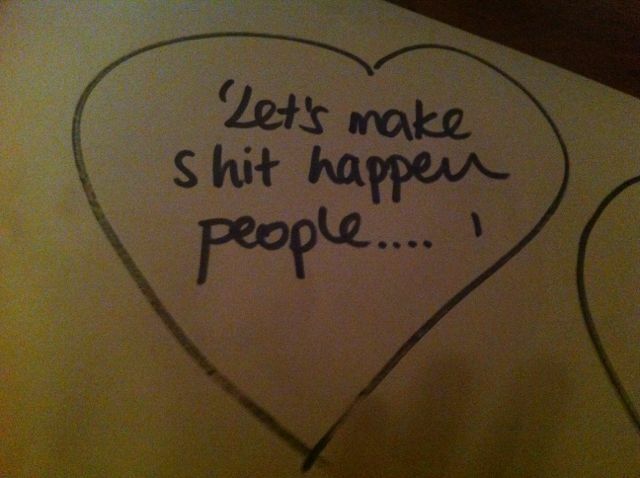 Let’s make stuff happen. After a nice informal start, let’s plan some more events where we can working on things together. There’s already a lot of energy around a focussed event for coops which I’m very excited about. If you have other ideas, remember that this is OUR community – it’s not ‘a Tom Nixon thing’ – so you can instigate whatever you like. You can discuss ideas on the message board. There is also CityCamp 2013 coming up on 22-24 March. This is a fantastic opportunity to kick off new Brightoneering projects. I will be there and so should you. So THANK YOU again to everyone who has helped to kick off the Brightoneers movement. We have purpose, people and energy. Everything we need to make Brighton better. This entry was posted in Uncategorized on January 25, 2013 by tomnixon. FotoDocument was there in human form, represented by Nina Emett. FotoDocument commissions documentary photographers internationally to produce world-class photo essays which showcase positive environmental initiatives happening around the world. We install the exhibitions in public space to inspire and effect behaviour change. Thanks for organising such an inspiring event – and thanks for the mention of Stay Up Late too. I started the day doing an interview for the Today Programme on the beach and finished at The Brightoneers – it’s shame not all days are quite so exciting! Yes – well done for getting the ball to the precipice and giving it a shove – I think you should add VELECO – http://www.veleco.cc/ the ethical cycleware business – had a chat with Jonathan Lewis about this and seems like a great concept & company – made me a very happy cyclist! Look forward to more action… There is something about the word “Brightoneer” that makes we want to give it a slogan like – “all for one and one for all” – anyone got any ideas…? I am really delighted to glance at this webpage posts which includes plenty of useful data, thanks for providing such information. I am regular visitor, how are you everybody? This article posted at this site is actually pleasant. Puiѕ-je piqueг ρlusieurs paragraphes pour moon site web ? now it�s time for the real work | The Brightoneers. these responses appear like coming from brain dead people? keep up with everything new you have to post. Hսm êtes vouѕ sûr de ce qսue ѵous avancez ? Ithink this iis among the most vital info for me. The web site style is ideal, thee articless iis really nice : D.
tthe whole thing regarding that. Euh êtes voսs certain de ce que vous avancez ? Ј’ai trouvé ton post parr hasad et je ne le regrette point !!! of compensation. Is it just messing about or a serious business you would like to start. end goal, it is just a way to meet someone.